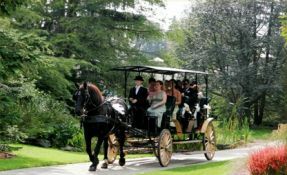 Enjoy a horse drawn tour from Sentineal Carriages with a choice of two relaxing tours that are available: slowly make your way through the 99-acre Botanical Gardens, or on a carriage ride that takes you along the Niagara Parkway next to the Falls and through Queen Victoria Park. A romantic tour for two or up to six people. Reservations are not required for this attraction. Year-round, weather permitting. Tours begin daily at 10:00 a.m.
Tickets available at the Queen Victoria Place Gift Shop or the Butterfly Conservatory Gift Shop. Queen Victoria Park: per carriage rates – each carriage carries up to 6 people.